We’d love your help. 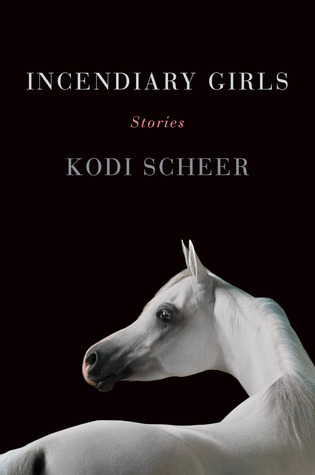 Let us know what’s wrong with this preview of Incendiary Girls by Kodi Scheer. Incendiary Girls explores our baser instincts with vivid imagination and humor. In these stories, our bodies become strange and unfamiliar terrain, a medium for transformation. In “Fundamental Laws of Nature,” a doctor considers her legacy, both good and bad, when she discovers that her mother has been reincarnated as a thoroughbred mare. In the title story, a mischievous Incendiary Girls explores our baser instincts with vivid imagination and humor. In these stories, our bodies become strange and unfamiliar terrain, a medium for transformation. In “Fundamental Laws of Nature,” a doctor considers her legacy, both good and bad, when she discovers that her mother has been reincarnated as a thoroughbred mare. In the title story, a mischievous angel chronicles the remarkable life of a girl just beyond death’s reach.In Scheer’s hands, empathy and attachment are illuminated by the absurdity of life. When our bodies betray us, when we begin to feel our minds slip, how much can we embrace without going insane? How much can we detach ourselves before losing our humanity? Scheer’s stories grapple with these questions in each throbbing, choking, heartbreaking moment. To ask other readers questions about Incendiary Girls, please sign up. Wow. This book packs more of a wallop than a punch! Here are my top five reasons why you should read this short story collection even if it's the only one you read in 2014! 1) Scheer's prose is of the variety that reminds you of the power of good literature. Her images leap off the page. Her wry, understated description of emotions will cut you deeply. 2) Her stories are truly one-of-a-kind. Where else are you going to find a collection that includes a love virus, a pregnant man, the Armenian geno Wow. This book packs more of a wallop than a punch! Here are my top five reasons why you should read this short story collection even if it's the only one you read in 2014! 2) Her stories are truly one-of-a-kind. Where else are you going to find a collection that includes a love virus, a pregnant man, the Armenian genocide, animal transformations, and Western medicine at both its finest and worst moments? 3) Along with the darkness and the critique of human behavior, there is a wicked sense of humor running throughout these stories that will make you laugh out loud. 4) Scheer’s use of point of view is innovative. In “Miss Universe” and “Salt of the Earth,” she makes great use of the collective first person or “we” narrator, and in “When a Camel Breaks Your Heart,” she nails the second person “you” narrator. “Incendiary Girls” is told from the point of view of an angel of death. 5) Her female characters are empowering. They are strong women, often working in the field of medicine, mothers, wives, and daughters, who are complex and dynamic, loving and fierce. I'm not exactly sure if she meant it to be, but if any inspiration from Kafka was used to craft the narratives in this book, it was definitely felt. It's difficult to review a book steeped in magic realism, as it usually lends to such an ambiguous tone, and ambiguity is not one of my favourite literary devices. I sometimes hate being left to my own imagination, as insane as that sounds, coming from an avid reader. Kodi Scheer was successful in her efforts to mix reality with surreality, but I wa I'm not exactly sure if she meant it to be, but if any inspiration from Kafka was used to craft the narratives in this book, it was definitely felt. It's difficult to review a book steeped in magic realism, as it usually lends to such an ambiguous tone, and ambiguity is not one of my favourite literary devices. I sometimes hate being left to my own imagination, as insane as that sounds, coming from an avid reader. Kodi Scheer was successful in her efforts to mix reality with surreality, but I wasn't blown away by every story in Incendiary Girls. If I had to pick, my favourite was probably one of the shortest: Miss Universe. A tale in which one of the contestants was, quite grotesquely, torn limb from limb. It was a literal translation of the jealousy, and competitive madness, that is felt by the people participating in such an event. Incendiary Girls was like an acid trip of literary proportions. It was like handing a pen to the raw, human brain, and then asking it to draw pictures. It's not often we are allowed to drop our filters, and think true thoughts, or act on impulses that lurk just beneath the surface, so close. Kodi Scheer's writing was engaging, and thought-provoking, even if those thoughts sometimes veered into very weird territory. It was truth, cloaked in some fantastical notions, and bouts of magic. Incendiary Girls was definitely one of the most strange, but invoking, narratives I've read thus far. If you're in the mood for something very different, you'll want to be picking this one up. Recommended for fans of: Jose Saramago, Magic Realism, Short Stories. This excellent collection of short stories by debut author Kodi Scheer is one of the most memorable books I've read in a long time. Though the tales concern themselves with many different types of people--overworked medical students, young parents, lovers from different backgrounds, transplant patients, pageant hopefuls, military wives--they are drawn together by sharply observed moments of pathos and humor. Scheer's protagonists face real and familiar problems but do so through the lens of the This excellent collection of short stories by debut author Kodi Scheer is one of the most memorable books I've read in a long time. Though the tales concern themselves with many different types of people--overworked medical students, young parents, lovers from different backgrounds, transplant patients, pageant hopefuls, military wives--they are drawn together by sharply observed moments of pathos and humor. Scheer's protagonists face real and familiar problems but do so through the lens of the fantastic: one woman, afraid she is losing her elderly mother, is haunted by a cadaver she is dissecting in class. Another discovers that her partner has become a camel. Incendiary Girls is a breathtakingly honest look at how, as women, when our bodies, or parts of our bodies fail us, we still have our souls to keep us from falling apart. Ellen, in "Fundamental Laws of Nature," wants to be Incendiary Girls is a breathtakingly honest look at how, as women, when our bodies, or parts of our bodies fail us, we still have our souls to keep us from falling apart. Ellen, in "Fundamental Laws of Nature," wants to believe that the soul of a dead loved one returns to her in a most peculiar form while trying to come to terms with the personal fear that she will disappoint her daughter if she reveals her secret. And, Angela, in "Transplant," undergoes a life-saving surgery, altering her outlook on life and causing her to search for answers where she never imagined. Who are these grizzly contestants who want to expose the fake for who she really is in "Miss Universe?" This story was grotesque but speaks volumes about the human nature. This is the shortest story in the collection but was one of the most profound. Poor Kate, in "Gross Anatomy," can't seem to shake the ghost of her medical school cadaver as she tries to care for her mentally ailing mother while fearful that she may also be slipping into insanity at a young age. In "When A Camel Breaks Your Heart" we are faced with the end of a relationship that was exotic and exciting but we knew would never be realized as lasting forever; how our lover becomes strange and unfamiliar to us, as unfamiliar as a camel, in the end. "No Monsters Here" gives us a glimpse into the mind of a frightened wife and mother of a soldier during a time of war. As parents we want to protect our children, whether they are normal or different, like Olivia in "Primal Son." Even going to extremes to make them feel loved and accepted in their own family. But, it was the title story, "Incendiary Girls," and the story Vartouhi, which spoke volumes to me. A young girl struggles to survive and learn the balance of life and death while being followed by an angel of death her entire life. I was moved to tears by the end of this 24-paged story. This is Kodi Scheer's first collection of short stories and after reading it I found myself going online to search for more of her work, most recently appearing in the "Michigan Quarterly Review" and "Printers Row." I shall be getting my hands on these very soon. Scheer's writing is darkly beautiful yet uplifting. Of course, there were some stories which I did not favor, not because they weren't well written, but more along the lines that I didn't prefer the format of the story being told. Still, I found myself pausing periodically throughout this book, contemplating what I'd just read, before continuing on with the current story. These stories are thought-provoking and are a metaphor for much deeper realities than are on the page. These stories should not be taken at face value. They are so much more valuable than that. Kodi Scheer combines her medical training and understanding with magic realism to form an original collection of short stories. In Fundamental Laws of Nature - a woman doctor and cancer sufferer believes her daughter's horse is the reincarnation of her mother. Transplant - a story about a woman with a transplanted heart who becomes a convert to Islam; this is about a woman searching for hope. Miss Universe - the contestants turn violently on Miss Afghanistan. Gross Anatomy - a medical student is Kodi Scheer combines her medical training and understanding with magic realism to form an original collection of short stories. Gross Anatomy - a medical student is visited by the cadaver she is dissecting. When a Camel Breaks Your Heart opens with the line: Your lover hasn't always been a camel. Yesterday Mahir was human. But this isn't a simple surreal story, it is a sad painful portrait of a cross-cultural relationship. No Monsters Here - a wife and mother with OCD starts finding body parts hidden in her home. These belong to her doctor husband who is on duty in Iraq. Salt of the Earth - an account of an outbreak of a love virus in a small town. Modern Medicine - a nurse in a burns unit tries to cope with the trauma of her work by abusing drugs. Primal Son - how do a couple cope when their much wanted baby is born an ape? Ex-Utero - a medical student's experience on the ward. Incendiary Girls - an account by an angel of death of a young woman's experience of the Armenian Genocide. A shocking account of a terrible and forgotten event in twentieth century history. The author's medical insight is important to these short stories, not just in terms of her choice of subject matter but also in how she sees and portrays the world. In addition, in Transplant, Miss Universe, When a Camel Breaks Your Heart, No Monsters Here and Incendiary Girls there is a focus on war, genocide and intercultural relations. I received this book from the publisher via Netgalley in return for a fair review. This is a bizarre collection of pieces to be sure. My usual approach to any short story collection is to read straight through in order, just as I would chapters in a novel. This time, though, I mixed it up a bit. We have company in this week so shorts were definitely the perfect read but with time in mind I skipped around and read out of order. And so the story "Miss Universe" was one of the first I read rather than the third in order. This is a brutal little tale about Miss Universe competitor This is a bizarre collection of pieces to be sure. My usual approach to any short story collection is to read straight through in order, just as I would chapters in a novel. This time, though, I mixed it up a bit. We have company in this week so shorts were definitely the perfect read but with time in mind I skipped around and read out of order. And so the story "Miss Universe" was one of the first I read rather than the third in order. This is a brutal little tale about Miss Universe competitors literally tearing apart the competition! I was surprised when I read it, but as I progressed further through the collection I realized it was indeed a perfect fit. Other stories include "Transplant" where a woman adopts a new religion in the hopes that her prayers will be answered. "Fundamental Laws of Nature" finds a woman facing the same potential death sentence that took her mother but she finds solace in imagining that her daughter's horse is in fact her reincarnation (the dead mother's, that is). In "No Monsters Here" a woman whose husband is off fighting in Afghanistan begins finding pieces of him throughout her home and begins to fear the worst. "Salt of the Earth" was probably my favorite story in the bunch. In this tale a town is plagued by a love virus! Let's just say I was flummoxed by this one. This is a collection of short stories. Some were worth reading but the majority were too "out there" for my taste. I also dislike profanity so some were too crass for me. I wouldn't waste my time on this book. When writing about a collection of short stories, the brain always wants to stitch connecting themes together. There are multiple references to childbirth, the medical profession, and military service in Scheer's odd and wonderful collection of short stories. But there's also extreme magical realism, much lesser magical realism, some bits that could be considered magical realism but also just be considered strange-ish real life - no magical realism needed - and some fewer bits of flat out fantas When writing about a collection of short stories, the brain always wants to stitch connecting themes together. There are multiple references to childbirth, the medical profession, and military service in Scheer's odd and wonderful collection of short stories. But there's also extreme magical realism, much lesser magical realism, some bits that could be considered magical realism but also just be considered strange-ish real life - no magical realism needed - and some fewer bits of flat out fantasy. I adore magical realism but there's always a broad gray area, of which Scheer manages to cover every bit, where this tactic can vary wildly. When the majority of the narrative is much more towards the fantasy/supernatural side of things, I have a tendency to like it less overall; this is because I prefer the magical realism over the fantasy. I much prefer stories where it's much more like real life with some magical realism bordering the edges or, especially, when the descriptions could even just be considered a sparkly edge to a grounded real-life environment. In most of the stories here, Scheer manages this balance perfectly. All of the stories center around women. A woman concretely believes that the mare her daughter trains with is her own mother, reincarnated. Funny that the mare should show up in their lives just when she's been diagnosed with cancer, from which her mother died. The title story feels, on the whole, extremely real life and gritty involving a girl who may or may not live through a genocide... except that her biography is told from the perspective of Death. A medical student is also her mother's caretaker; adding to the burden is the corpse she is dissecting following her home every night. A young woman jokes with her Arab boyfriend that, to relieve his anxiety about the war, they should get a pet camel. The next morning, a camel shows up in their apartment but the boyfriend is nowhere to be found. I have two devices, a Kindle and Sony eReader, for reading. I had originally planned to read Incendiary Girls after a novel waiting on my eReader. Except, I had a trip into the city and forgot my eReader. Instead I brought my Kindle along and realised far too late that it was the wrong device. So what to do? My city trip involved lounging around waiting on the grounds of Sydney Uni. Incendiary Girls is a collection of short stories. I decided I could always switch back to the original proposed read in-between some of the stories and then continue on with Incendiary Girls at a later date. Well, didn’t my plans fall through? I read almost half of Incendiary Girls within the space of time I was waiting and probably would have finished it the same day if I hadn’t of had a full schedule. I found myself wanting to keep picking it up when I was forced to put it down. I find myself wanting to pick it up now and I’ve finished reading it. I’m sure I’ve stated time and time again, on BA, that I love short stories. They’re a break from full length novels and a great way to sample an author’s work when you haven’t read it before. Incendiary Girls is a great collection of darkly humorous, thought-provoking, and ultimately bittersweet stories. On several different occasions I found my heart aching with sadness for the characters, but then was rewarded with moments of revelations when characters found a kernel of hope and understanding. Incendiary Girls is a commentary on life and human nature delivered via way of quirky bundles that don’t come across as either cliched or preposterous. The mother being reincarnated as a horse, so as seen by her daughter, for example was something I found completely acceptable and especially in the face of the protagonists recent discovery. Unusual? Yes. Jarring? Definitely not. Every story was written with smoothness and depth. Each character was fleshed out thoroughly and every conclusion suited each situation. I found it difficult to switch off after finishing Incendiary Girls. I couldn’t stop pondering each of the character’s experiences and what could possibly have happened to them next. I received an advance copy of this book from the publisher in exchange for an honest review. I confess that while I love reading short stories, reading short story collections is rarely my thing. By the time I make it halfway through, I’ve pretty much lost steam –like I’ve gone on a short story binge and need a decent purge (say, a novel). There are other annoyances for me – such as an imbalance of quality, where a few stories leave me nearly breathless and others leave me wondering what accident of fate allowed all of these stories to be included in a single collection? The stories in Incendiary Girls are weird—which is not meant as a pejorative. They are, in short, “medically weird”. A cadaver follows a med student home, until the student eventually learns his secret. An “intersexual” learns he is pregnant and demands an abortion. The body parts of a soldier away at war being to appear in his wife’s home. Some of the stories seem less “medically weird” and therefore out of place in this collection, although the writing is still strong. I’m referring in particularly to the first two stories and the final (title) story “Incendiary Girls,” which, if I bumped into in a literary magazine, I’d probably gulp down. Here, they serve as bookends to an unrelated collection of stories in the middle. However, these middle stories worked extremely well, with repeated images, subjects, etc., functioning as a sort of glue to tie them together. Incendiary Girls has moments of sheer, brilliance--horror in “Miss Universe” and heartbreak in “Modern Medicine” and love and acceptance in “Primal Son”—in short, moments where style and substance marry extremely well. What was interesting to me—and unsettling, as well—was the way characters reacted to the abnormal events in their lives—giving birth to a primate, for example, or realizing a boyfriend has turned into a camel. Mostly, the characters were disturbed by a change in circumstance, but not horrified or incapable of action. It was as if they were saying, “Oh, well. Now I’ll have to make the best of this situation.” At times this was convincingly eerie. I look forward to other works by Ms. Scheer. Incendiary Girls is a collection of short stories that are unforgettable and non-traditional. Many of the stories have the thread of medicine running through them as well as some magical or fantastical elements. Sometimes the stories are disturbing yet for every story I was intrigued and wanted to find out where the author was leading me and how the story would end. My favorite story is the title story because it is based in Turkey during the Armenian genocide. When a Camel Breaks Your Heart is Incendiary Girls is a collection of short stories that are unforgettable and non-traditional. Many of the stories have the thread of medicine running through them as well as some magical or fantastical elements. Sometimes the stories are disturbing yet for every story I was intrigued and wanted to find out where the author was leading me and how the story would end. My favorite story is the title story because it is based in Turkey during the Armenian genocide. When a Camel Breaks Your Heart is odd and funny and was super entertaining. I also really liked the story Gross Anatomy. There are eleven beautiful, unsettling, unique and strange stories in this collection. Give yourself permission to laugh at the oddities and imagine the absurd and just go with it. I love how the cover is represented in stark black and white and how it reflects the stories inside. Medicine, illness, sickness is so often portrayed in black and white circumstances. Either your sick or your not sick but humans and their bodies are anything but ordinary and Scheer explores the human body with a little bit of wonder and a lot of intensity. I love short stories and try to read at least one a week. With Incendiary Girls, I read one a day. I couldn't stop. Scheer does an excellent job juxtaposing reality with fantasy and having her patients (I mean stories) exhibit fundamental psychological symptoms of the creative variety. She is a great storyteller. The eleven stories in Incendiary Girls challenge the reader to explore parts of the human brain and human emotions they rarely think of. The stories contain fantastical elements; a lover who changes into a camel, a man who unknowingly contained male and female anatomies and is now pregnant, a Death Angel who is pleased to wrongly predict an early death. The stories also contain references to medical knowledge. Many of the narrators either are studying medicine or interact with medical surroundin The eleven stories in Incendiary Girls challenge the reader to explore parts of the human brain and human emotions they rarely think of. The stories contain fantastical elements; a lover who changes into a camel, a man who unknowingly contained male and female anatomies and is now pregnant, a Death Angel who is pleased to wrongly predict an early death. The stories also contain references to medical knowledge. Many of the narrators either are studying medicine or interact with medical surroundings. What the reader experiences is an exploration of how humans react in extraordinary circumstances. Even in extremis, we tend to reach out and search for connection with those around us who can help us weather difficulties. Most of the characters reach resolution in some way, either by overcoming the circumstances they encounter or by accepting that their lives have changed and things will be different from the norms they have lived with. Kodi Scheer teaches writing at the University of Michigan. Her stories have appeared in the Chicago Tribune, the Iowa Review and other publications. She has won the Dzanc Prize for Excellence in Literary Fiction and Community Service. Readers who read these stories will be challenged and enriched by human experiences not commonly encountered but that explore human limits. This book is recommended for anthology readers and those interested in the human experience. I received a free copy of this book through the Goodreads First Reads program and would like to thank everyone who made that happen. This is a pretty fantastic book of short stories. I gave it only 4 stars because I did not like every story - some of them just didn't hit the mark for me but the ones that did were really great. All of the stories were very original and touched on overall themes of mortality and fate. The collection as whole was at turns both grotesque and poignant, and in places b I received a free copy of this book through the Goodreads First Reads program and would like to thank everyone who made that happen. This is a pretty fantastic book of short stories. I gave it only 4 stars because I did not like every story - some of them just didn't hit the mark for me but the ones that did were really great. All of the stories were very original and touched on overall themes of mortality and fate. The collection as whole was at turns both grotesque and poignant, and in places bizarre and experimental. The standout story for me was the title story, "Incendiary Girls". A heartfelt, moving story of incredible hardship and survival and the importance of telling stories. Another story that left a lasting impression was "Miss Universe". I initially judged this one as bizarre and silly but the more I thought about it the more I came to appreciate the clever play on the idea of literally picking apart your competition. My least favorite story of the collection was "Salt of the Earth". This one has a different feel to it and was the only story that dragged a bit for me. I feel like, when there are fantastical or surreal elements to a story, that they should serve a purpose. They should amplify or, in comparison, minimize some aspect of the story to get to a certain underlying truth. I don't think a story if very successful if it has a surreal element just for it's own sake or to only allow an ending with a clever twist. Many of these stories have surreal elements; many even border on grotesque. It's a mix of success in this collection and, to be honest, the grot I feel like, when there are fantastical or surreal elements to a story, that they should serve a purpose. They should amplify or, in comparison, minimize some aspect of the story to get to a certain underlying truth. I don't think a story if very successful if it has a surreal element just for it's own sake or to only allow an ending with a clever twist. Many of these stories have surreal elements; many even border on grotesque. It's a mix of success in this collection and, to be honest, the grotesque stories are the most successful. 'Miss Universe' is a 3-page, glorious, jaded nugget. 'Gross Anatomy' and 'No Monsters Here' were strong. 'When a Camel Breaks Your Heart' is a center-piece of the book, but I think it kind of missed the mark for me. I bit of a missed opportunity, but I still like it. These stories run the gamut in terms of mood, from darkly humorous ("Miss Universe") to nostalgic, tinged with regret ("Gross Anatomy"), and everything in between. The ease with which Scheer moves me, as reader, from one emotional space to another, how naturally she brings me to her characters, brings her characters to me, brings her characters back to their own selves are all signs that I'm in a masterful writer's hands. I found especially poignant the ways we glimpse humanity, the line between These stories run the gamut in terms of mood, from darkly humorous ("Miss Universe") to nostalgic, tinged with regret ("Gross Anatomy"), and everything in between. The ease with which Scheer moves me, as reader, from one emotional space to another, how naturally she brings me to her characters, brings her characters to me, brings her characters back to their own selves are all signs that I'm in a masterful writer's hands. I found especially poignant the ways we glimpse humanity, the line between living and being alive, presented in this collection. Several stories touch upon the body, the medical, ideas of healing-- both physical and emotional. And on top of all this plentitude, is a clean style reminiscent of my two favorite Amy/Aimee-s: Amy Hempel and Aimee Bender. This book of short stories was very different and entertaining, but a lot of the same literary themes were used in the stories. I understand coherency of a short story collection, but not to the point that it gets tiresome. I think of all of the stories I liked the one about the girl and her camel boyfriend best (along with the angel of death story. NOTE: I received a free copy of this book for review. First off, short story collections aren't my thing... I just start getting into the story and it ends! This particular collection (the author's debut) is fresh and intriguing, more than a little quirky, and occasionally disconcerting. A number of the stories deal with the difference between belief and reality -- or how belief changes perceptions of reality. "Skeeter's wife, Kasey, kept pouring the doubles for him, bending over the bar every chance she got to show off her cleavage, which wasn't half bad for a middle-aged woman who'd lived fast and hard."